Richard Wolters had a remarkably positive and pro-active approach to life, despite the fact that, at a tender age, he had suffered some very severe personal set-backs. Born in 1921 at Niederkruchten in the Lower Rhine region of Germany, he was confronted with the Nazi regime and, in 1940, also with the insanity of World War II. He was severelyn injured in action in 1941, leaving him with a permanent physical handicap, and unable to participate in further military service. These early influences led to a strong inclination towards peace, justice and international reconciliation which, in the years to come, became one of his personal trademarks. In the war years of 1941 to 45 he studied geological sciences and completed his studies with a PhD from the University of Bonn under the supervision of Hans Cloos, the developer of tectono-geomechanical model experiments. Shortly after completing his studies, he joined the Geological Survey of the State of North-Rhine-Westphalia and became heavily involved in the reconstruction of war-devastated Germany. bringing together both engineers (the German Geotechnical Society) and geologists (the German Society for Geo-Sciences); a structure that has proved successful and has been continued to the present day. 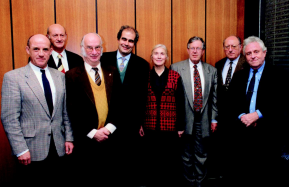 functioning international association and was responsible for establishing a secretariat, upgrading the bulletin to a well-regarded international journal, initiation of the newsletter and the setting up of an award to recognise work done by outstanding scientists in the promotion of engineering geology, the Hans Cloos Medal, named after his teacher in Bonn. Richard Wolters was tireless in his efforts to bridge the then ‘Iron Curtain’ establishing links with eastern Europe, and equally tireless towards the west, developing friendships in particular with French colleagues. As a consequence, the IAEG secretariat was relocated from Germany to Paris in 1980 and his outstanding efforts were acknowledged with the French Chevalier de l’ordre national du Mérite. scientific achievements and his dedication to the advancement of engineering geology. He was honoured posthumously by award of the Hans Cloos Medal in 1982. In 1984, during a council meeting held in Moscow, EM Sergeev suggested that the IAEG should establish a new award to commemorate Richard Wolters and, “to honour his many contributions to international understanding and cooperation“. The Richard Wolters Prize was introduced, “specifically to recognise meritorious scientific achievement by a younger member of the engineering geology profession“. of EM Sergeev. In 2010 a new format for awarding the Richard Wolters Prize was trialled as part of the 11th IAEG congress in Auckland to encourage younger engineering geologists, and those with non-academic experience, to contest the prize. The new format was set along the example of the National German “Forum for Young Engineering Geologists” which, since 2003, had established itself as a key event for young professionals in Richard Wolter’s native country. Following the Auckland event, the judging committee and the Forum’s chairman, Helmut Bock of Germany, made a series of further recommendations, in particular, the lowering of the age of eligible ‘young’ professionals to below 40 years. The new recommendations were further trialled in Banff 2012, and the IAEG bylaws were changed to reflect the new procedure at the council meeting in Beijing 2013. The changes included the lowering of the maximum age to 35 years and a requirement that those contesting the prize should attend the IAEG conference or congress in that year to present their work and respond to questions on it. If you would like to read more about Richard Wolters please refer to chapter 7 where Valentina Shibakova, a senior scientist at the Geological Institute of the Russian Academy of Sciences (Moscow) and past secretary of the USSR national group, presents her memories of him.